In the land of the undying and eternally cursed, there are few who do not long for freedom. It matters little how you first arrived in the Mistlands, nor what you had to do to escape; though you may break free of its borders, the mist and its monster are not far behind. It is time to return to the gloom from which you fled, and to shatter the chains that bind you to the dark realm of Waiqar the Undying. 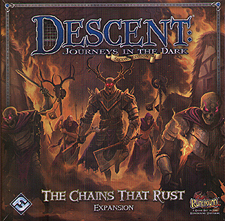 The Chains That Rust is an expansion for Descent: Journey in the Dark Second Edition. In the thrilling stand-alone, high-level campaign found within, the heroes must brave the vile, haunted Mistlands one more time. While opposing the corrupt servants of Waiqar the Undying, the heroes must search for a cure to their cursed half-dead codition. Failure will condemn them not to death, but to something much worse: an everlasting un-life.